Two of the nations premier basketball programs clashed in Tuscon earlier this week as the Oregon Ducks upset the Arizona Wildcats 83-75 to snap the nation&apos;s longest home winning streak at 49. While news of this win made headlines in college sports, what some of Ducks had on their feet is making news in the sneaker community. Already known to have some of the best PE sneakers in the game, several Ducks&apos; players debuted another Nike KD8 during their road victory. 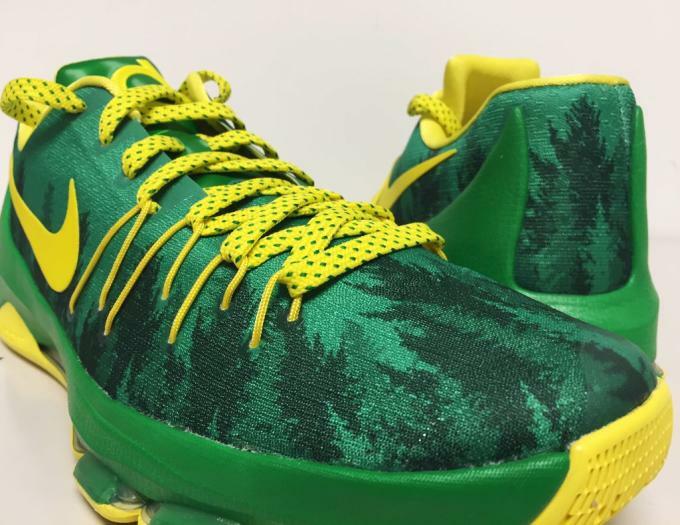 Courtesy of Go Ducks&apos; Twitter, we get a closer look at the green "In the Woods" KD8 which features a unique tree pattern inspired by the one used on the floor of the school&apos;s Matthew Knight Arena. This is the second KD8 the Ducks have received this year following the yellow pair they wore against Baylor earlier this season.